Chokgyur Dechen Lingpa (Tib. མཆོག་གྱུར་བདེ་ཆེན་གླིང་པ་, Wyl. 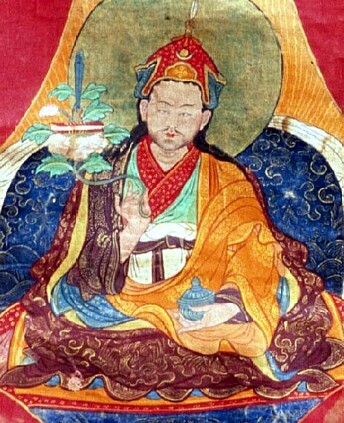 mchog gyur bde chen gling pa) (1829-1870) — the famous tertön Chokgyur Lingpa, the emanation of Prince Murub Tsenpo, was born in Nangchen in Kham. He was a contemporary of Jamyang Khyentse Wangpo and Jamgön Kongtrul, and, like Khyentse Wangpo, was entrusted with the seven special transmissions. His terma revelations, the Chokling Tersar, include the Tukdrup Barché Kunsel and the Three Classes of the Great Perfection. ↑ Padmasambhava & Jamgön Kongtrul, The Light of Wisdom, Vol.1 (Hong Kong: Rangjung Yeshe, 1996), page 286. Andreas Doctor, Tibetan Treasure Literature: Revelation, Tradition and Accomplishment in Visionary Buddhism, Ithaca: Snow Lion, 2005. Dudjom Rinpoche, The Nyingma School of Tibetan Buddhism, Its Fundamentals and History, trans. and ed. Gyurme Dorje (Boston: Wisdom, 1991), vol.1 pp.841-848. Nyoshul Khenpo, A Marvelous Garland of Rare Gems: Biographies of Masters of Awareness in the Dzogchen Lineage (Junction City: Padma Publications, 2005), pages 431-435. Tulku Urgyen Rinpoche, Blazing Splendor: The Memoirs of Tulku Urgyen Rinpoche (Boudhanath, Hong Kong, Esby: Rangjung Yeshe Publications, 2005), Ch. 5, 'My Great Grandfather, The Treasure Revealer'. Orgyen Tobgyal Rinpoche, The Life of Chokgyur Lingpa, Rangjung Yeshe Publications, 2000 (see External Links below).